From the My Theatre blog, posted by Kelly Bedard: The final show of The Word Festival was a comic look at the King James Bible through the eyes of four devout Christians; something I was hesitant about seeing but ended up loving more than anything else at the festival (yes, including all the Shakespeare). 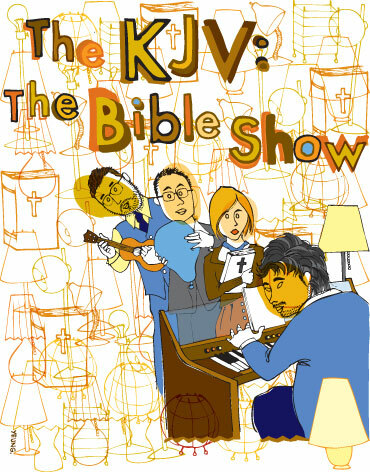 The KJV: The Bible Show is filled with rousing original songs and hosted by four captivating artists, each of whom take to the mic at least once to share a monologue of their experiences with the KJV. What makes the show unique is its earnest appreciation for its subject and unabashed honesty about what it means to be a Christian in todays society. Its a startlingly honest show that almost brought me to tears as the multiple sides of whats supposedly The Good Book were highlighted. Its a remarkable piece of theatre that entertains as much as it forces you to re-organize your thoughts on what it means to be a believer of any kind. The Word Festival, November 25 to 27, 2011, was orgainzed by The Young Centre and Albert Schultz, Artistic Director of Soulpepper Theatre Company.